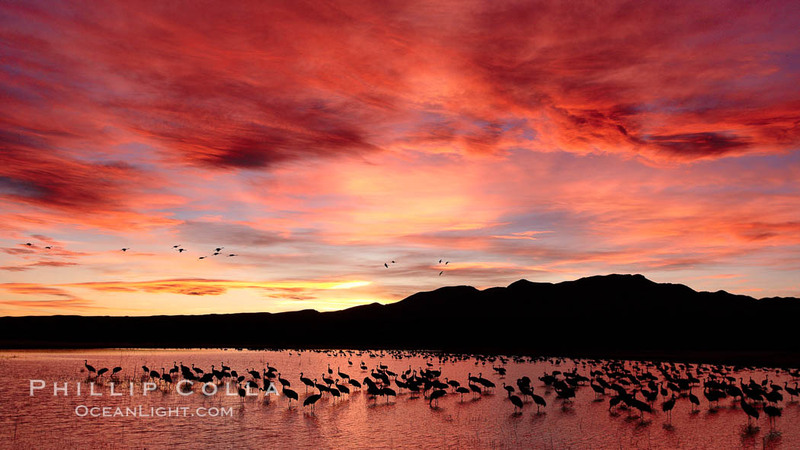 Sandhill cranes (Grus canadensis) arrive at the “crane pools” at Bosque del Apache National Wildlife Refuge each evening. Having spent the day feeding in nearby corn fields, they will overnight standing on their long legs in the shallow pools, presumably so that they can rest in the dark with minimal threat of attack from coyotes. As the sun rises the next morning, they warm up and eventually depart to the corn fields again. This location is perhaps my favorite spot in all of Bosque del Apache. Skip and I made a point of being here for sunrise and sunset photography most days during our in visits to the Bosque in 2008 and 2010.